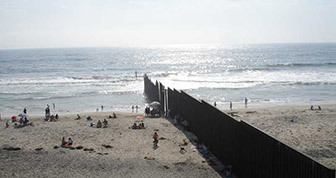 US Border Patrol Agents arrested an unidentified man in September after spotting him approximately 600 yards from shore just north of the U.S./Mexico border. The swimmer was floating on a duffle bag holding more than $23,000 in illegal drugs. Inside the bag, federal agents said they found seven bundles of marijuana weighing more than 50 pounds. The man, described as a 55-year-old Mexican citizen, was taken into custody.